Paper 4 3/4" x 7"
1 PMS color printed on Side 1 of uncoated 80lb Gray Fiber stock. 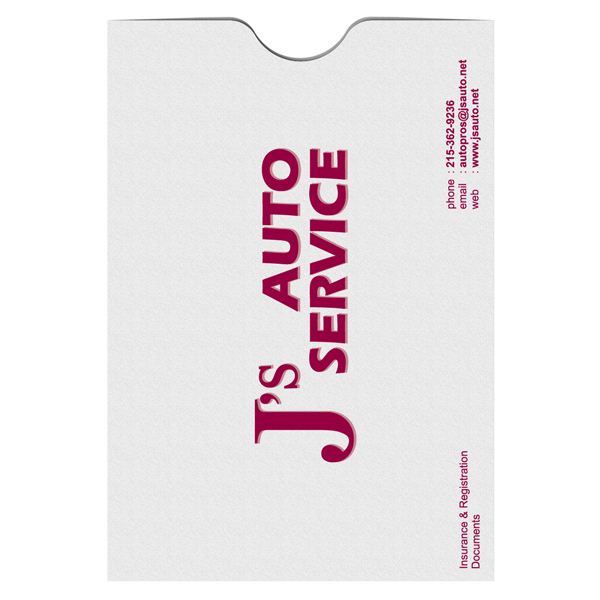 Maroon accents on gray stock create a down-to-earth design for mechanic shop J's Auto Service. The garage's contact information balances the small label that tells drivers their insurance and registration papers are inside the pocket. The back panel invites readers to obtain J's Maintenance Club Card for savings opportunities on future vehicle repairs. 1 PMS color printed on Side 1 of uncoated 80lb Cream Fiber stock. 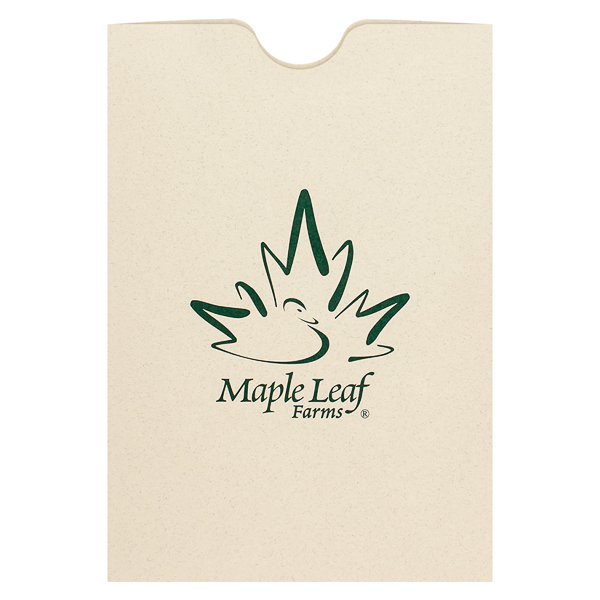 A duck hidden in Maple Leaf Farms' logo reminds clients of the brand's locally raised, thoughtfully produced duck meat. The forest green logo mimics the color of an actual maple leaf and also contrasts the pale Cream Fiber stock, which is speckled like a bird's egg. The farm's name in an italicized serif font is traditional with a touch of elegance. Fr8Hub's sleek and modern card sleeve design features a complementary color scheme of orange and muted blue. The 8 in the logo mimics a highway, fitting for a company that specializes in trucking industry technology. Only the company website and its simple (but intriguing) tagline "You're invited" is on the back. 1 PMS color printed on uncoated 80lb Smooth White stock. 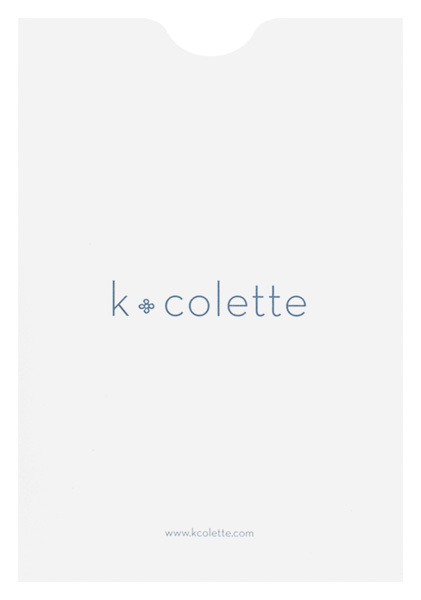 This K Collette document card sleeve is full of class and style. The sleek cover features only the company name and website in a modern sans serif font, with a flower logo in the space between K and Collette. On the back is a thank you message and lines to write the name of the recipient, the person who packaged the document, and any other necessary notes. Wrap 4 3/4" x 7" insurance papers, receipts, or other documents in this full-coverage product. Thumb notches on both panels make it easy to grip the edge of the contents and extract them, so customers are more likely to reuse the product and the papers inside. Sealed on three sides, it protects cards from bending, wrinkling, or getting lost. Its convenient size makes it easy to slip into a purse or pocket. Both exterior surfaces are customizable with branded elements or informational text. Dimension Closed: 5" x 7 1/4"
Acceptable Insert Sizes: 4 3/4" x 7"